So many updates, it's scary! This month, I have a lot (no, I mean A LOT) of exciting publishing updates to share. But, to have this many updates, I've had to spend a lot of time in the writing cave (you might have noticed I've been a little MIA from social media lately and there was no August or September newsletters). I have to admit, I'm a little starved for conversation; this writer needs to talk to humans! (my cats are great, but their conversation seems to consist entirely of "What are you doing, hooman?" and "Hooman, my foodz place is empty."). To that end, I'd love it if all of you could come hang out with me online on Wednesday, October 25th. The time and location/mode of get together TBD... by you all. Do you want to do a group chat, a video chat, a Facebook Live stream? To let me know your preferences and to RSVP, fill out this short survey at: https://www.surveymonkey.com/r/B8XSFN8. Now, on to the updates! At the end of this month, HEREAFTER (Afterlife #1) and THEREAFTER (Afterlife #2), the first two books of my contemporary paranormal fantasy series will be leaving Kindle Unlimited. In addition, the price of the e-book of HEREAFTER will increase from $0.99 to $2.99, so be sure to grab your copies today! It's the annual Spooktacular Giveaway Hop, and I'm giving away a paperback copy of THEREAFTER (Afterlife #2) and a pack of cute Zombie Girl Postcards. Over 50 bloggers and authors are giving away a variety of prizes; be sure to visit them all! Visit my website at http://www.terribruce.net to enter. I am MORE EXCITED THAN I CAN EXPRESS to announce that I will be part of the forthcoming Myths and Magic box set. Details are under wraps for the moment, but the official announcement is coming soon. Suffice it to say this will be a collection of 15 or more full length stories from a variety of authors, including a half dozen NYT and USA Today Best Selling authors!!! You are not going to want to miss this. The best part? 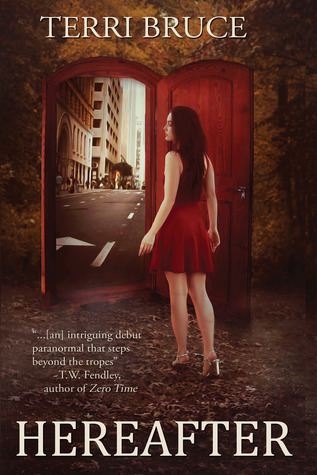 My story, titled IRENE AND THE WITCH, is a stand alone excerpt from Whenafter (Afterlife #4)! Whenafter is nearly complete, with a tentative release date of spring 2018, but if you don't want to wait that long, you can get a sneak peek of what's next for Irene by purchasing this box set, which will be available in November. Stay tuned - more details coming soon! My short story, "A Night in Philadelphia," is included in the latest Chicken Soup for the Soul collection, titled, "Step Outside Your Comfort Zone," (available for pre-purchase on Amazon, on sale everywhere October 31st). This short non-fiction piece is about the night I wandered an unfamiliar city in an attempt to attend a benefit concert and the profound impression that night left on me. 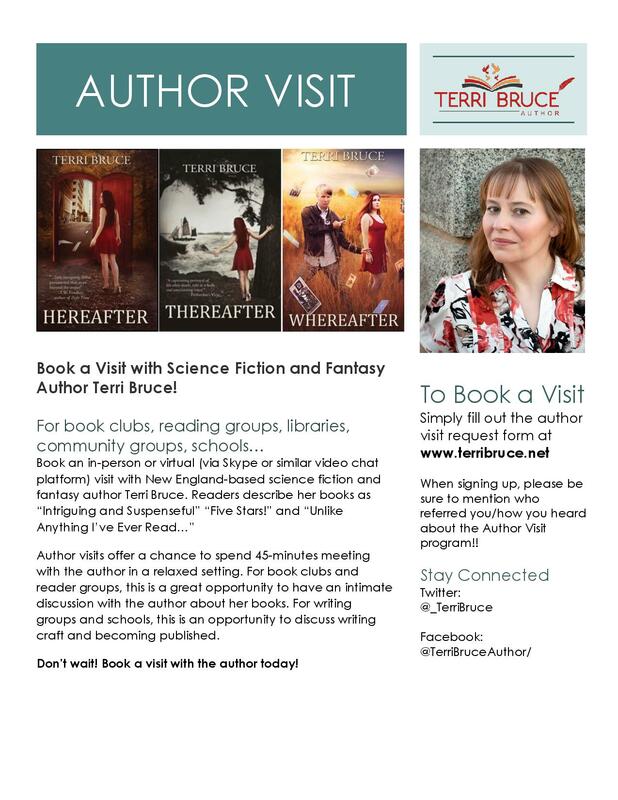 Just a reminder, am available to meet with book clubs, community groups, schools, and writing groups - at no cost - through my Author Visit Program. I love connecting with fans and readers, and this program gives me the ability to meet with smaller, more intimate groups in informal settings. I also think it's important to give back to the community of writers coming up behind me by sharing my experience as a writer and author, as was done for me when I was "coming up through the ranks," and I love that this program provides an opportunity to do that. To learn more about the Author Visit Program - and to book a visit (don't be shy!) - visit the Author Visit Program page on my website. And that, as they say, is all the news that's fit to print. As always, thanks for reading!